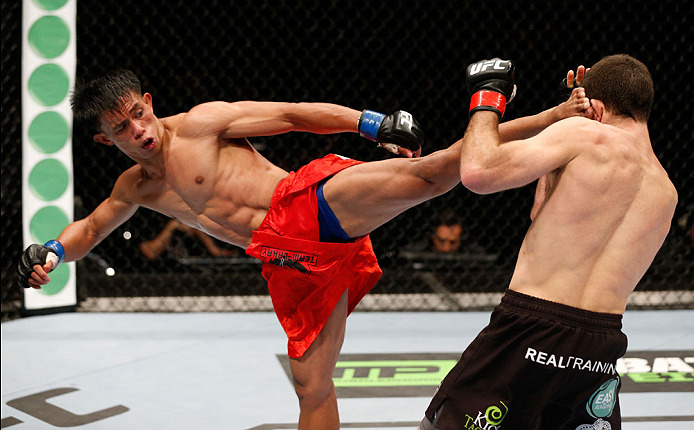 Roldan Sangcha-an of Team Lakay will fight for the Philippines on May 16, 2015 at the UFC Fight Night 65 in Manila. He will face Jon delos Reyes from Guam, USA. - Sangcha-an who failed to win his first fight at UFC vs Richie Vaculik last year is coming back and prove that he is a worth fighter of UFC. Sangcha-an is a 24 years old fighter and has record of 4 wins including 2 wins by way of submission and 2 wins by KO and has only 1 defeat. Sangcha-an is one of the top prospect from Lakay team. - Jon "The Heat" Delos Reyes is a 27 years old fighter from Guam, USA. A former PXC fighter same as Sangcha-an. Delos Reyes has a record of 7 wins including 4 wins by submission and 3 by KO and has 4 losses. Delos Reyes lost his last 2 fights at UFC. Frankie Edgar vs Urijah Faber will be the Main Event of UFC FIGH NIGHT 65. No other Filipino scheduled to compete in this event but Mark Eddiva and Mark Munoz wants to join this event..